Acknowledged author Celeste Roseberry-McKibbin wrote An Advanced Review of Speech-language Pathology: Preparation for the Praxis and Comprehensive Examination comprising 686 pages back in 2015. Textbook and etextbook are published under ISBN 1416406867 and 9781416406860. 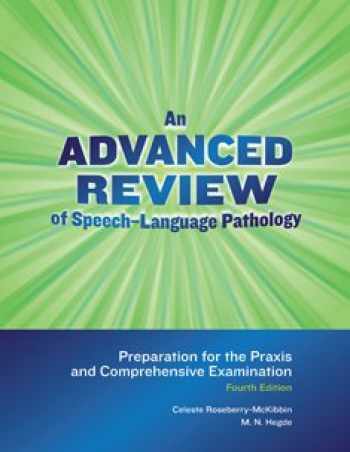 Since then An Advanced Review of Speech-language Pathology: Preparation for the Praxis and Comprehensive Examination textbook received total rating of 3.5 stars and was available to sell back to BooksRun online for the top buyback price of $26.84 or rent at the marketplace. This popular national and international best seller and the #1 choicefor Praxis-SLP is a must for your library! The fourth edition featuresnew, updated test questions based on the very latest edition of thePraxis examination. It is a comprehensive review, study guide, textbookand reference rolled into one. Only the most current, important, and relevant information isextracted from the entire field of speech-language pathology. Eachchapter includes practice questions in multiple-choice formats, alongwith answers. Quick response codes (QR codes) embedded throughout thechapters can be scanned to lead you immediately to relevant websiteswith extended information.